Photo Laplante’s storefront business was established in Laval over 50 years ago. It specializes in photography and serves professionals and amateurs alike. In today’s cyberage, Photo Laplante had to find a way to increase its presence and raise its competitiveness through its website. 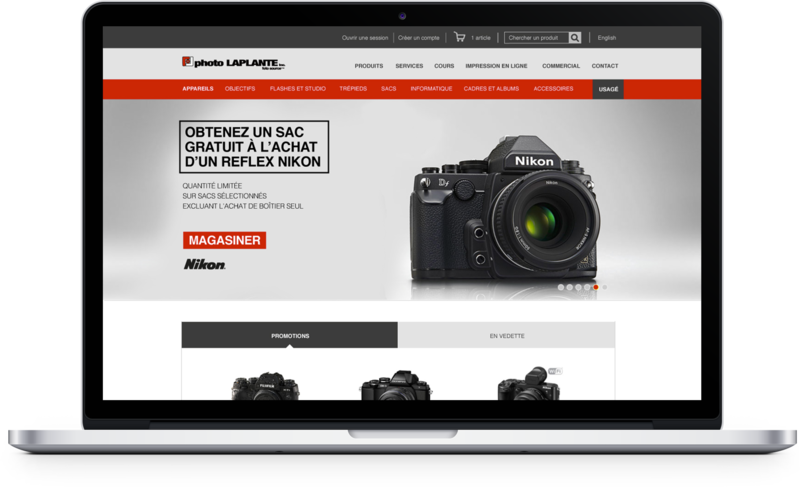 By analyzing Photo Laplante’s business operations, we created a link between its inventory and accounting system and its website. 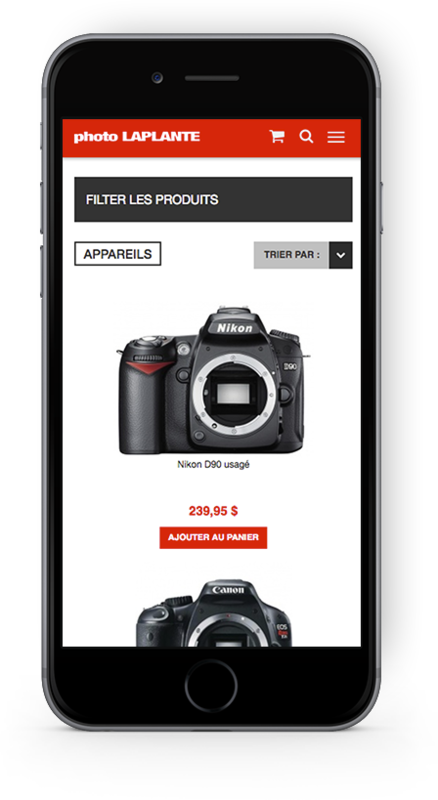 As a result, the Photo Laplante team can keep track of its inventory and prices between the two systems without human intervention. A bilingual platform, 100% custom made! Simplified checkout form to reduce dropped purchases. Prompts to consult other products by displaying product browsing history, similar products, and ancillary products. Creation of a product configurator and comparer so that clients can easily find what they’re looking for. One of our mandate's objectives was to simplify the management process for the Photo Laplante team. To that end, we designed a synchronization system between their website and the software that was managing their inventory. The system ensures that the website's inventory is seamlessly updated after an in-store purchase has been made and vice versa. We designed a stand-alone newsletter management system through which the Photo Laplante team can manage its promotions and view mailing statistics. This system enables the team to promote products and photography courses as well as personalized items by making use of each client's purchase history, brand loyalty, place of residence, etc. Reorganizing the catalogue enabled us to split up categories that had too many products, making the new categories more intelligible and simplifying the search process. With the rise of mobile devices, it’s critical for the consumer to be able to find a product quickly and easily. An ever-present search function is the ideal solution to be able to navigate an online catalogue containing thousands of products. While shopping for products online, the product configurator suggests complimentary and compatible items enabling the consumer to build up their photography kit. One of Photo Laplante's biggest challenges is to stay competitive with big-box retailers. With this mind, we developed a price comparer that shows real-time prices of any product offered by its competitors—very useful for planning upcoming promotions! It's crucial for Photo Laplante to be able to respond quickly to any price changes made by its competitors. We developed a stand-alone promotion management system that defines ahead of time various types of discounts that will automatically be applied at the appropriate time and to the appropriate products. Nothing is left to chance after a promotion. The Photo Laplante team has access to sales reports to evaluate the effectiveness of each promotion. The team can then pass on the reports to its suppliers should a reimbursement be in order.